OTSEGO COUNTY — A number of local athletes were included on the recently announced All-Ski Valley Conference softball team. Johannesburg-Lewiston senior infielder Abby Schlicher, J-L junior outfielder Sydney McKenney and St. Mary sophomore outfielder Katie Rutkowski were all First Team selections. Making the Second Team was St. Mary senior catcher Christina Smith, senior infielder Jada Bebble and sophomore pitcher Savannah Sullivan. St. Mary juniors Kari Borowiak and Caylee Lawnichak made Honorable Mention, as did J-L senior Katie Kierczynski, sophomore Allison Ellis and freshman Emily Aisthorpe. Pitchers: Emily Estep, Onaway; Kallie Derrer, Mancelona. Infielders: Dakota Derrer, Mancelona; Caitlin Connolly, Inland Lakes; Abby Schlicher, J-L; Megan Estep, Onaway. Outfielders: Morganne Badgero, Onaway; Katie Rutkowski, St. Mary; Sydney McKenney, J-L.
At Large: Temara Lupu, Onaway; Alexis Carpenter, Central Lake. Pitchers: Savannah Sullivan, St. Mary; Mackenzie Verellen, Bellaire. Catcher: Christina Smith, St. Mary. Infielders: Jada Bebble, St. Mary; Kourtni Birgy, Forest Area; Tori Rybinski, Pellston. At Large: Jade Galer, Onaway; Channing Hoogerhyde, Central Lake; Lindsey Friday, Mancelona; Katie Thornton, Bellaire. Taylor Robbins, Mancelona; Logan Allen, Mancelona; Emma Pierson, Central Lake; Allie Hines, Central Lake; Ali Lampman, Bellaire; Kari Borowiak, St. Mary; Caylee Lawnichak, St. Mary; Emily Aisthorpe, J-L; Katie Kierczynski, J-L; Allison Ellis, J-L; Tori Kirsch, Pellston; Megan Milbrandt, Pellston; Breah Carter, Pellston; Hanah Carter, Pellston. District Saturday holds the potential to be highly lucrative for area softball teams, as Johannesburg-Lewiston and St. Mary square off in Hillman, while Gaylord travels to Gladwin. The Division 4 District will look familiar for the Snowbirds and Cardinals as the two teams will most likely meet each other at noon for Saturday's District Semifinals. The Snowbirds will have to defeat a plucky Wolverine team Tuesday to enter into the semis. The results of the game were unavailable at press time. J-L will no doubt gunning for the Snowbirds, with the usual rivalry emotion amplified by a St. Mary blowout sweep during the regular season. The Cardinals fell to the Snowbirds in straight sets, 10-2 and 9-2, on May 16. Ranked as an Honorable Mention team in the final Division 4 coaches poll of the season, St. Mary (15-4) will be the odds-on favorite to pass the Cardinals (11-9) and move onto the District finals. The Snowbird offense has been smoking this season with six players over the .300 mark, including Christina Smith, Jada Bebble, Kari Borowiak, Allie Rutkowski, Katie Rutkowski and Bekah Myler. 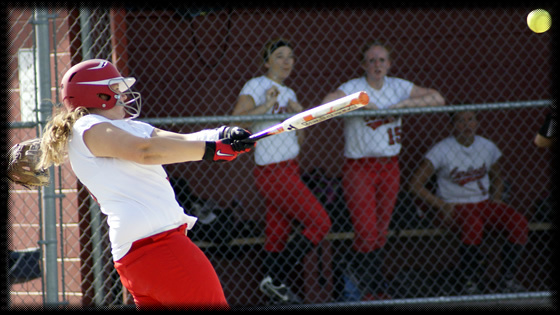 Savannah Sullivan can swing for the fences, proven by her three out of the park home runs. Sullivan and Borowiak take turns in the pitching circle for St. Mary. 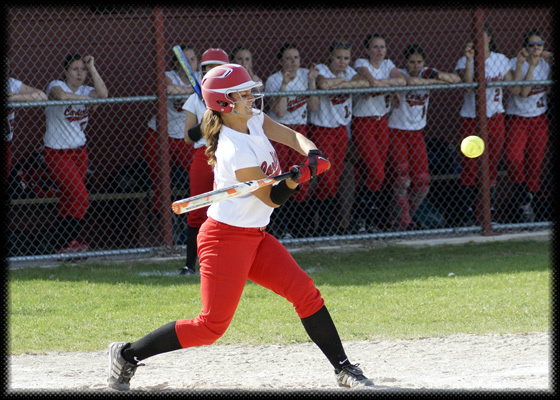 J-L is led by Abby Schlicher, who's batting average has hovered around the .500 mark all season long. Senior leadership will have to be big for the Cardinals, with Katie Kierczynski needing to call a solid game behind the plate for J-L as she has done consistently throughout the season. Allie Ellis steps in as the ace pitcher for J-L.
Saturday afternoon does not get any easier with two state-ranked teams in Hillman (Honorable Mention) and Posen (No. 8) meeting in Tuesday's first round. The winner will face Atlanta at 10 a.m. in Saturday's semifinals with the Finals set to begin at approximately 2 p.m. The District champion will move onto the Regionals at Sault Ste. Marie Saturday, June 8. Either Rogers City (No. 3) or Onaway (No. 6) could lurk there. In Division 2 at Gladwin, a youthful Gaylord team will take a stab at a District that could be anyone's grab. First up for the Blue Devils will be a Gladwin team that is also youthful and has taken its lumps this season. The Gaylord 1-2 pitching punch of Allie Sobeck and Lauren Mead posses the ability to break through. Favorites Ogemaw Heights and Cadillac battle in the other semifinal. Cadillac is the host of the Saturday, June 8 Regional. GAYLORD — A large crowd lined the field at St. Mary to watch two pitchers with extremely bright futures square off, as Johannesburg-Lewiston visited the rival Snowbirds. In a battle of sophomore hurlers, St. Mary and Savannah Sullivan bested J-L and Allie Ellis, 10-2 and 9-2. In the bottom of the first inning, Katie Rutkowski got the Snowbirds’ havoc started with a single to left field. The squad never looked back, stacking up six runs as the first five batters reached base. Rutkowski, another St. Mary sophomore, had a quality doubleheader, hitting 4-for-8 on the day. Sullivan continued her stellar season with another strong performance. Sullivan allowed nine hits, but kept them scattered throughout the game, striking out four and walking one. 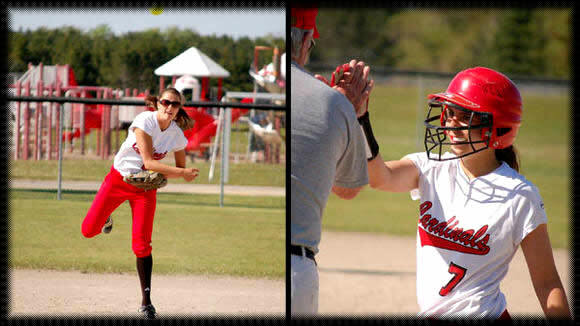 Abby Schlicher and Emily Aisthorpe each had two hits for the Cardinals (11-9, 9-7 Ski Valley). Despite falling behind quickly, Ellis battled throughout the game. Three of the 10 runs given up were earned as Ellis struck out three batters and also walked one. St. Mary senior Jada Bebble was the hitting star in game one, going 3-for-4. Christina Smith added a two-run double in the first inning rally. The nightcap game eventually was taken over by the St. Mary bats as Bekah Myler went 3-for-4 with a two-run single in the third inning and another RBI in the sixth. “She (Myler) had a couple of key hits and ran the bases well — very aggressive like we want them to — and when you run the bases aggressively, good things happen,” Cruz said. St. Mary had 10 hits and five walks in game two. On the other side, the Cardinals managed four hits off St. Mary junior Kari Borowiak. Borowiak was backed by solid fielding from Rutkowski, Gabby Schultz and Danica Bebble in the outfield, as well as Sullivan at shortstop. The Snowbirds (12-2, 10-2 Ski Valley) find themselves back on track at the right time to still look at competing for a Ski Valley crown. They’ll need some help, as Onaway still only has one conference loss after sweeping Mancelona Thursday. The Division 4 Districts start Tuesday, May 28, with St. Mary battling Wolverine. Peppin is banking on seeing the Snowbirds in the semifinals Saturday, June 1, at Hillman. GAYLORD — The Johannesburg-Lewiston softball team earned a split in a non conference home battle with Boyne City Monday. The Cardinals won the opener 9-3 before dropping the nightcap 13-2 in a game where a number of substitutes saw the starting lineup. Allie Ellis earned the victory in the first game, scattering two hits and three walks in four innings, while striking out three. Abby Schlicher provided relief, pitching two perfect innings with three strikeouts. “Both threw very well and controlled the game,” J-L coach Mark Peppin said. Schlicher had two hits and two RBI's, while Erin Kortman had two hits and scored twice. Hannah Huff and Emily Aisthorpe each doubled, while Sydney McKenney, Haylie Haase, Sarah Korff and Ellis each added hits. Schlicher pitched four innings in the second game, allowing nine hits and three walks. The offense had trouble getting going with Miranda Kortman, Ashley May, McKenney and Schlicher each collecting hits. Peppin said Madison Ewing did a strong job at catcher in the second game. J-L is now 9-7 overall and 7-5 in the Ski Valley Conference heading into Thursday’s doubleheader at St. Mary. 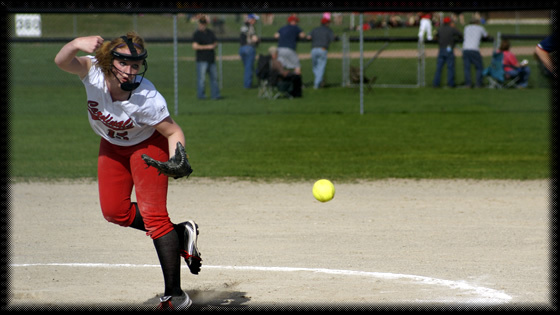 After a streak of strong play, the Johannesburg-Lewiston softball team dropped a pair to a strong Mancelona team Monday at home. The Cardinals fell 4-2 in the first game and 9-1 in the second. Abby Schlicher went 2-for-3 with a run and sacrifice bunt in the first game. Sydney McKenney also drove home Julia Nieman. But it wasn’t enough to stop the Lady Ironmen. Sophomore Allie Ellis pitched well, allowing five hits and six walks in the complete-game outing. She struck out six in her seven innings of work. In the first inning of the second game, steady catcher Katie Kierczynski made a nice play to snare a pop fly, but Mancelona still plated two runs. From there, it was all Lady Ironmen as Kallie Derrer’s slew of strikeouts hindered J-L’s effort. Ellis knocked in McKenney with a sharp single to account for J-L’s only run. Ellis started the game in the pitching circle before being relieved by Schlicher. The two combined to strike out four. “The big difference between the two games is their little rally got to us,” Peppin said. “We kind of shut down after that.” Schlicher added a double in the loss. INDIAN RIVER — The Johannesburg-Lewiston softball team won a pair Friday at Inland Lakes before dropping two at home Monday against Mancelona. The Lady Cards are now 6-4 both overall and in the Ski Valley Conference. In Friday’s opener against the Bulldogs, sophomore Allie Ellis went seven innings, giving up four hits, while striking out three as J-L won 4-2. At the plate, senior Abby Schlicher led the way, going 2-for-4 with a double. Katie Kierczynski, Erin Kortman, Emily Aisthorpe, Haylie Haase and Ellis added base hits. It was much easier in the nightcap, a 13-1 J-L win. In that game, the Cardinals exploded for 15 hits. Sydney McKenney, Hannah Huff, Kierczynski, Schlicher, Ellis and Aisthorpe each had two hits, while Kierczynski had four RBI's, Schlicher three, and Huff and McKenney two apiece. McKenney capped off an impressive game with three runs and three stolen bases. Ellis and Schlicher combined to shut down Inland Lakes in the pitching circle. “It took us a bit in game one to find our swing, but once we did, they just couldn’t contain our hitters,” said J-L coach Mark Peppin. A recap of Monday’s doubleheader against Mancelona will be included in Saturday’s edition. JOHANNESBURG — Coach Mark Peppin is taking this year’s expectations for the Johannesburg-Lewiston softball team seriously. When asked what the goals for this season’s squad were, Peppin responded by simply stating, “District championship.” Somewhere around May 28, depending on how the Division 4 pre-district draw goes, the Lady Cardinals will begin their quest for that goal. They may have the opportunity to exact revenge for last season’s early dismissal from the playoffs at the hands of Posen in a 12-0 mercy. The Vikings continued on to take the District trophy. This season, Peppin hopes that a couple of additions and a solid core of returning veterans will translate into more runs. Depth at the mound was added in the off season with sophomore transfer Allison Ellis, who has a strong arm and comes in as a solid No. 2 pitcher. Schlicher was responsible for pitching in all of the team’s 15 victories last season and recorded 100 strikeouts, in addition to a team-leading .485 batting average and area-leading 34 RBI's. The other senior on the squad is first baseman Hannah Huff, who will attempt to replace one of a small amount of assets missing from last season’s team — Samantha Banaszak, who recorded 203 putouts on the way to a Herald Times All-Area season as a senior. Other additions to the team include junior Julia Nieman, who has had a good spring in her first varsity campaign, and sophomore Haylie Haase. “Haylie has looked very good and has worked herself into a playing position,” Peppin said. Key returning players include Erin Kortman, Miranda Kortman and Gracie Kierczynski. Although the preseason has been a wet one in Otsego County and it has been a slow start to the season, Peppin takes responsibility for the outlook this year and is pleased with how his team has responded.